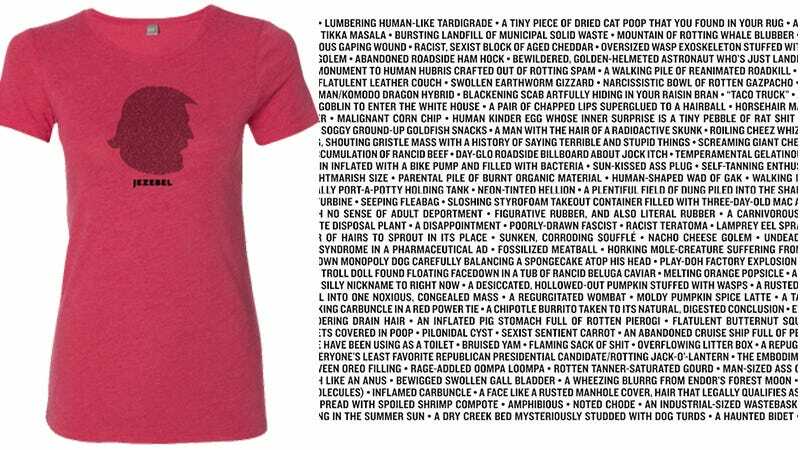 The Jezebel store arrived last month and we just added a new design that features a few descriptions of our president-elect. Use promo code 20SAVEUSALL for 20% off your order. We’ll be ramping up the designs over the coming weeks and months but tell us what we’re missing and what you want to see in the comments. And remember, you can always find a link to the store on the footer of the Jezebel homepage, or just remember store.jezebel.com. Use promo code 20SAVEUSALL for 20% off your order. If you have any questions about your order, or any of our products, please don’t hesitate to contact us at jezebel@goodsie.com. We will do our best to reply within 24 - 48 hours or less. If you have any business related inquiries, proposals or partnership related ideas, contact us at store@jezebel.com.